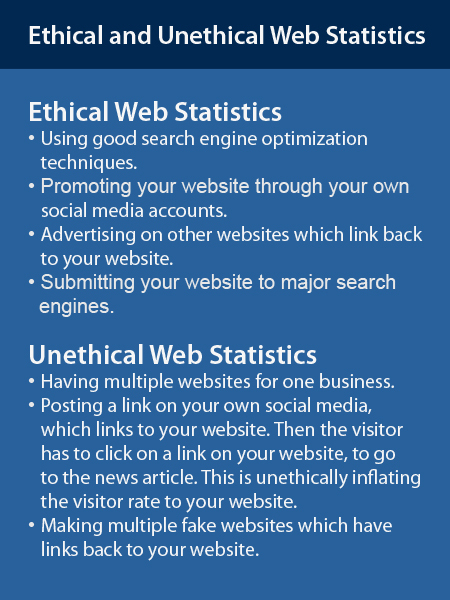 Search Engine Optimization; Ethical and Unethical Web Statistics. (San Diego, California, USA): Most businesses want to see lots of traffic to their website. But how does a company get legitimate traffic? In my book, there are ethical ways to get web traffic and there are unethical ways to get web traffic. When people use Google and type in search terms to find websites and an internet user visits some of the the first web sites to appear in a Google Search Results List, this is usually due to good Search Engine Optimization (SEO) of each website and is usually the most ethical way to get web traffic. While Search Engine Optimization is a complex process and while search engines, such as Google, seem to have a endless amount of changing SEO requirements each year for web designers, I hope to provide some basic information about SEO Best Practices standards. Also, I think it's important to include ethical about your own web statistics. There are multiple ways to have your website search engine optimized. One of the best ways to start, is have a good web professional working on your website, a writer and graphic designer. A website professional is not, I repeat NOT — a professional writer. While website professionals must be able to work with graphics, a website professional is not, I repeat, NOT — a graphic designer. If you don't know the definition of a graphic designer, it's a person who can take images, graphics, fonts, text (from a professional writer) and manipulate all of these to make a web graphic, banner ad, poster, book cover, flyer, book, magazine, newsletter, signs, business card (or anything in print or digital to read) and the information is easy to read and understand for their intended audience. As opposed to an illustrator who is someone who can draw by hand or by using programs such as Illustrator and Photoshop, to create an original piece of artwork or graphic. Some graphic designers are illustrators. Some are not. Most graphic designers can create simple background illustrations for projects but might not be able to create intricate and jaw-dropping artistic illustrations. As in all professions, you can find graphic designers with excellent skills and you can certainly find mediocre graphic designers. The same is true for any profession, including web designers, writers and even business owners! A half-decent web professional should be able to read this article without being too confused by the terminology. If a web professional is reading this article, I hope they will learn something and I also hope I'll get an email or tow with recommendations with tips to add to this article. However, if you are an administrative assistant and asked to make graphics, or to build and/or maintain a website, then I recommend you get a new job — or put your foot down and tell your boss to go take a hike. Tell your boss if he wants to send you to school and pay you the salary of a web designer, then so be it. Otherwise, tell your boss that he/she needs to hire a web designer. Of course, writing articles and the reality of the job market are two different things. I've seen many job titles requiring a web professional to know how to program in multiple languages, be a professional writer/editor, be a graphic designer, be an illustrator, to have a thorough knowledge of Google Analytics and more. Yet, is there any company that actually pays a salary that actually compensates the employee for the plethora of technical skills that only a genius would have? Is there anyone smart enough to be highly proficient in all these things? Maybe. But my guess is not that many. However, if a business owner asks their non-licensed administrative assistant to repair a helicopter engine, this would be extremely unethical and illegal. People would think, "Why is this crazy boss asking an administrative assistant to work on a helicopter engine?" The same is true when a boss asks an administrative assistant to do the work on graphic design and/or their website. It's an unethical business practice for a boss to ask employees to take on a job task that they are not professionally trained for, even though it's not illegal. However, this type of thing happens, I'm sure, many times with a small businesses. While the employee can add their work duties to revising a website, that's all they say, if they are going to be honest on their resume. However, the employee does not have the training and skills of a good web professional. The exception to the rule would be if the administrative assistant was actually interested in becoming a web professional, started taking classes and then got additional pay for their work on a website, I see this as a good outcome. The boss who thinks they are saving lots of money by having an administrative assistant work on their website is not making sure that updates to navigation, search engine optimization techniques, and other items will be ignored and the website will suffer and visitor traffic could be reduced. The sign of a good website is that the content is well written (grammatically correct and with correct spelling), there is a web page explaining the purpose of the company, all products and services are explained well with well taken pictures, has real word questions and answers in a Frequently Asked Questioned section, has a history of the company, has a news section, has e-commerce (if can apply to that company) and has easy to find contact information. One needs to remember that your business website is your online brochure and for some companies, it is their online store. If you can quote prices and/or sell products through your website, you are doing better than many businesses. Having a complete and up-to-date website is critical to good Search Engine Optimization (SEO). Content, content, content. Good content means your visitors can easily find the overview of your company and understand the purpose of your company, understand each product and service and knows how to purchase these services, find the location of the company and know how to contact the company. Having a website where it's difficult to understand the purpose of your company and your products/services, is a disservice to all your visitors and hurts your company because you are not providing enough information for potential buyers. I'm seeing a alarming trend in small and large corporations to reduce the amount information on their website about their company. Web designers are making websites for businesses without an "About Us", "Contact Us" and "FAQ" (Frequently Asked Questions) pages. I am now seeing product and/or service web pages for many companies which now have very little information. If a company feels that having minimal information on their website is appropriate to sell their goods and services, then why have a website? Important to have web pages include: "Industries Served" web page, product and/or services web pages, an "About" page (which actually explains what the company is about), a "Contact" page with full address, phone numbers and email addresses, Frequently Asked Question (FAQ) page, press release/blog section, media section (including logos and photos that the media can use when writing articles about your company), key personnel (if this is necessary), a shopping cart (if your company sells a product) and a history of your company. A word about FAQ pages. The best FAQ pages are actual questions from customers. Are your FAQ questions actual questions or are the FAQ questions just made up? Do you have answer to these types of questions? What payment methods do you accept? Do you take cashier's checks and money orders? Paypal? What does it take to set up an account? Do you ship worldwide? A FAQ page which is updated throughout the year, based on actual questions which customers and potential customers have asked over the phone, is a FAQ web page that is very useful to your online customers and visitors. Never have "under construction" pages on any website. This is something which people did in the 1990s and at time, we thought that was cute. Not any more. Remember, people have lots of options to purchase products. Take for example, Amazon. If you sell products and Amazon sells the same products for a lower price, it would probably be helpful to have to a very informative website detailing each product and explain why it's better to purchase products from your company versus buying on Amazon. You might have excellent customer service by phone, guarantees, excellent customer support, expertise, repair services and etc., that Amazon can't provide — to help people to decide to purchase the product from your company and not from Amazon. The competition with Amazon is so difficult, many small and large businesses have already gone under. Good ways to ethically increase traffic to your website. 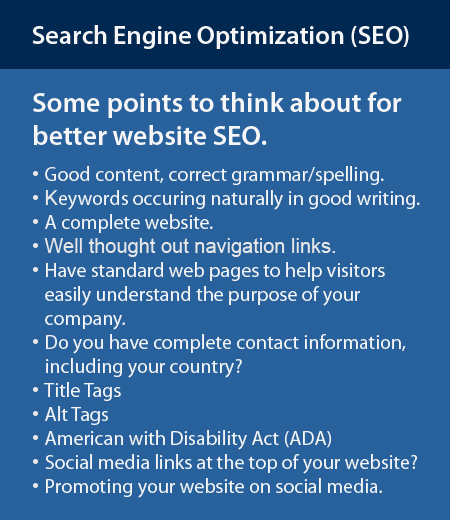 To help keep your website search engine optimized you can: Go over all web pages at least once a year to update when necessary, recheck spelling and grammar, update content, add new photos, revise navigation to make it easier to use, add more history each year to your history section, ask other websites to link to yours (such as vendors, industry associations and other businesses you are friendly with). Write blog articles and always include links from each blog article back to your website. If a magazine or newspaper writes an article about your company, ask them to put a link at the end of the article back to your website. From your social media pages, post links to your web pages. Explain why a particular web page is important, post a sales-only post about your product and include it's web page, or a post that questions "Have you seen our company history web page?" Ask vendors and industry associations to post social media posts about your company with a link back to your website. Buying advertising space on Helicopter Links will provide a multiple links back to your website. Advertising on Helicopter Links is for one full year and when you renew your advertising each year, these long lasting links will help with your website's search engine optimization. Let's use the example of a magazine or newspaper unethically trying to increase their web statistics, this is how its done. 1) Post a link to an article on your Facebook or Twitter page. 2) That link goes to your website. 3) However, when the visitor goes to your company's website, the article is not on your company website because you've posted a link on your website which links over to the actual article which is hosted on another website. This type of deceptive business practices will 1) Increase visits to their website, 2) Increase clicks to their website and 3) These false higher web states can now be used to tell their potential customers about their high visitor rates on their website which is why they should be paying high rates for their advertising. It is also unethical to this because 4) You are wasting people's time by making them jump from website to website to get to their final web destination. Another way to try to increase the amount of web traffic to your website is to make several websites which are either related or not related to your main business web page and then place many links from your other websites to your main website. You can simply lie to your customers about your visitor rates. In summary, I hope this (long) article can help you to see the importance of having a full-time web professional and that keeping a website up-to-date and filled with content is a key for good search engine optimization. We have not covered all items for good searching engine optimization here and I would always suggest that company's pay for their web professionals to take classes online or in a classroom to stay updated about the latest news on search engine optimization. I would always recommend the company provide a subscription to Lynda.com for their web professionals and graphic designers, to read articles about good search engine optimization and to attend one (or possibly two) seminars each year held for web professionals/graphic designerss. If you have any questions for us, please feel free to give us a call +1 (858) 413-7074 or email us at staff@helicopterlinks.com and let's discuss how Helicopter Links can help you advertise to buyers in the buying process.